So I've always wanted to try out the custom long tube CAI that everyone is hopping on board with on the N/A train. I've pretty much got it all covered, but I was really wanting to do a 4" straight pipe between the steering rack and radiator. Ive got the stock radiator and fans. Has anyone fit a 4" OD pipe there or is 3.5" all that will fit? Also, does anyone have any experience with a double step? I wanted to do 4" across the bottom, 3.5" traveling up, and then 3" to the Throttle body. A buddy of mine did 4" all the way so it will fit. Rubs a little but doesn't harm anything. Don't see why a double step would be bad. the point of the step is to increase velocity into the manifold. If you have access to a dyno bring a bunch of different lengths and test what length works with what pipe and where the steps are. this will give you the best power. I brought the different lengths and diameters to my dyno session. Ended up with a 3.5" all the way except for about 6" of 3" right before the TB. That seems to be the most optimized setup for an NA car. This looks a lot like what I want to do. Did you happen to try a 4" across the bottom, with the rest of the set up remaining the same? Id be curious to see if you guys are pulling a vacuum restriction with these long intakes and the size filter your running to accommodate the tight space. When incorporating a velocity stack, it seems to speed up the air enough to cause a surge in air speed and if the filter isn't large enough it actually pulls a vacuum I saw with some trial testing of my own with a short ram/stock size ram starting at 7k rpm. Id think a long tube would only exacerbate this? I pulled a vac with a Comptech foam filter, and a FAE cotton filter of similar shape/dimensions but with the added center convex filter at tip, but still wasn't enough free flow. I had to run a filter larger then OEM to keep from pulling a vac. and that doesn't fit anywhere but stock location. I've got the 6" velocity stack and AEM dry flow with the water sock stuffed down right behind the fog light area. I had a 7" velocity stack and vibrant filter that was massive on 4" piping like I mentioned above and this setup made significantly more power. I don't think the filter size is causing a restriction at this point, if anything the 4" piping and huge air filter decreased velocity far too much. I know we are making decent power out of these engines, but they only can move so much air at 2.0/2.2 liters of displacement. The filter should have little to no bearing on tuning as long as its large enough to not cause a restriction/vacuum - which is the obstacle I came across wile reconfiguring my old set up to current. I have a vac gauge incorporated into my intake tube so I can see how each filter is responding and at what rpm I start pulling vac if its an issue. I think as long as the filter has enough surface area to be free flowing then the engine essentially doesn't even know its there, and the pipe config and diameter/shape is the important part in tuning for power. The best option would of course to run no filter and just have the horn/velocity stack open to air. But that's not realistic, so next best thing is a large enough filter to do its filtering job without being part of the tuning equation - a restriction. These little 2.0/2.2 liter engines consume something to the order of 800cfm, akin to a modern v8. This is no ordinary breathing 4 banger. 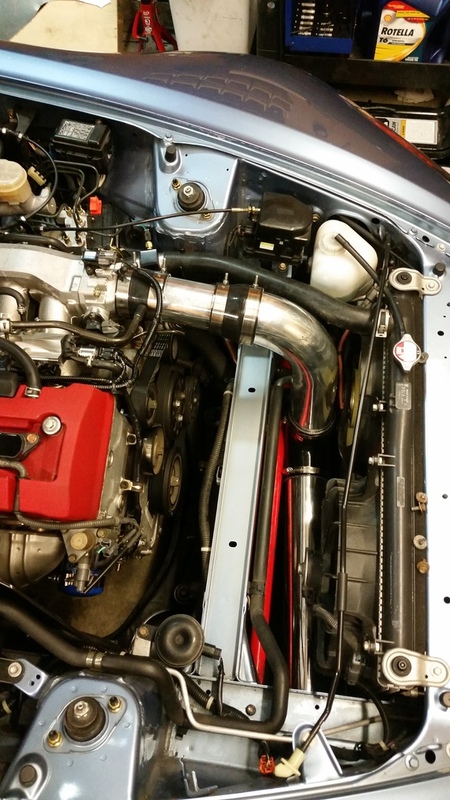 There is a reason it makes 120hp per liter and no other NA engine does. A filter you would see on a LS3 is essentially what this motor needs at min to insure its not pulling a vac, especially if you have a larger TB with matched port like I do. If your not at least running a filter the same size/surface area as oem, then your likely causing a restriction/vac and leaving power on the table in the upper rpms. Last edited by s2000Junky; 06-28-2017 at 09:41 AM. This is the filter I'm using. It fits down there but barely. You may be right that it is a restriction, but it seems to work well. I'm not too worried about getting every last job out of the car in NA form now, as I'll be putting on the Ptuning turbo kit in a while, but would be curious to see if this was a good choice or not. How are you reading your vacuum? With no load in the garage freerevving and with a mechanical vacuum gauge tapped in the tube or are you datalogging it? That's the same filter i run except i don't have it in a dry filter bags.